in Mobile Marketing with tags Adaption Rates, apps, Google Play, google+, Mobile, Smartphone, website Both comments and trackbacks are closed. As smartphone adoption rates continue to increase, consumers are spending 90% of their time on mobile devices within apps. Many companies are leveraging this behavior by creating apps that serve their brands. However, an app is only as successful as its usage. This blog post will summarize how marketers can leverage paid and natural search results with Google to help consumers discover and engage with brand apps. Specifically, we’ll explore how marketers can make their apps more discoverable, suggest value additive ways marketers can engage with consumers who have already downloaded their apps, and draw analysis on what to expect in the future as the line between “app” and “website” continues to blur. 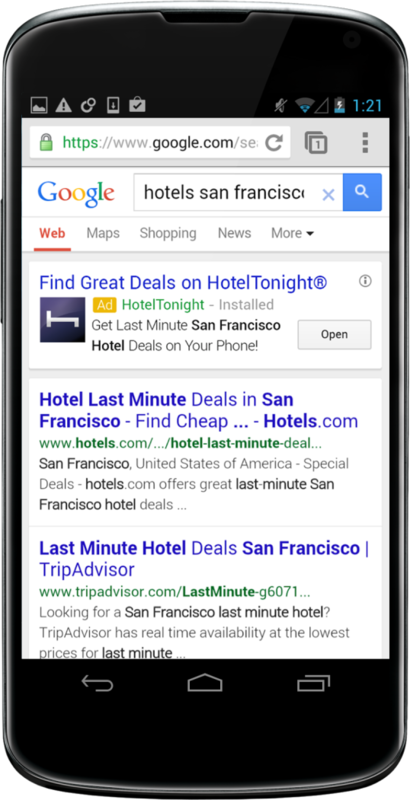 Google provides paid search opportunities that help consumers discover a brand’s app. Marketers should consider the below two ad options for increasing app discoverability. 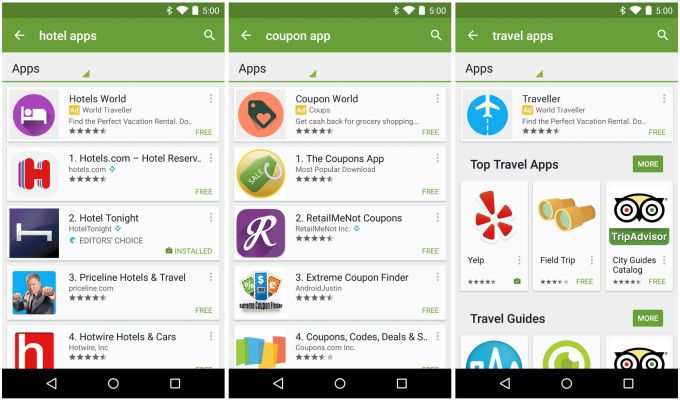 Google Play Store Ads: Google’s app store reaches over a billion Android users worldwide, and Google offers marketers the opportunity to tap into that reach by allowing ads to appear within the store’s search results. Marketers can manage ads similar to traditional text ads with keywords and bids, and Google also offers tools to track metrics like installs. Mobile App Install Ads: While mobile users spend most of their time within apps, mobile’s search query volume surpassed desktop volume last May. Search engines allow marketers to leverage this volume to promote app installs within paid search results. Ads can be tailored to direct searchers encouraging them to download the brand’s app, or they can also direct the searcher to visit the brand website instead. While paid ads can help with discoverability, natural results can help as well. 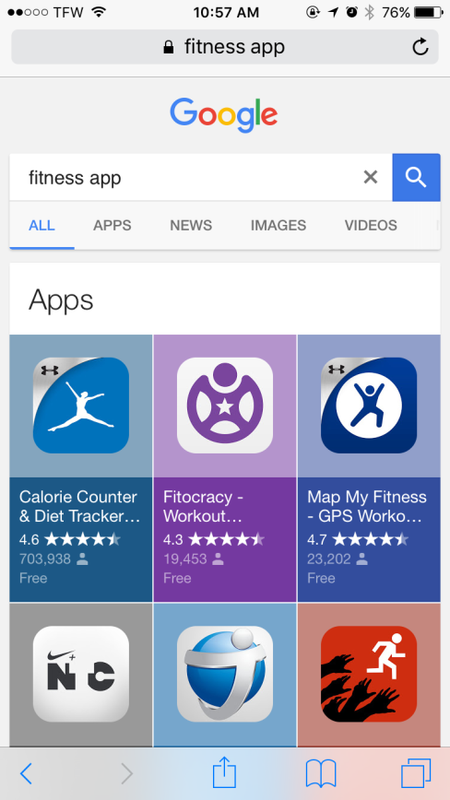 Google is already prioritizing apps in its results based on search intent (i.e. a user searches for a brand name and “app” in the query). However, in Google’s October earning’s report, CEO Sundar Pichai claimed that 40% of mobile results include an indexed app in the top five organic positions. In this context, app indexing can make apps discoverable by teasing users with relevant content from apps directly in the search results page, prompting them to install and open the app to get to their desired content. According to ComScore, 19% of apps are abandoned after first use. However, retention rates are improving as the number of users who engage with an app 11 or more times increased from 35% in 2013 to 42% in 2015. This improvement has been attributed to better developed apps and better strategies to reengage users. One important reengagement strategy is deep linking within natural results. Similar to how users get to deeper pages within sites on Google, properly implemented app indexing can help users navigate to the appropriate screen in a brand’s app directly from the search results page. Doing so will encourage users to keep coming back to the app when they are searching Google for something relevant to the app. Marketers can also use paid search ads to drive reengagement from mobile users who’ve previously installed the app. 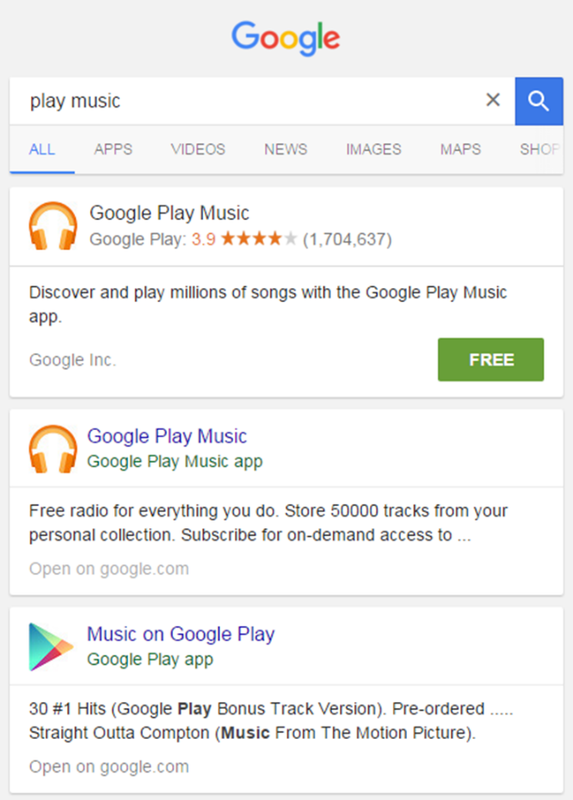 Google’s reengagement ads are similar to the previously mentioned Mobile App Install ads. Instead of encouraging searchers to download the app though, marketers can instead deep link searches into an already installed app to promote additional use. While today’s paid and natural search tactics can help marketers drive app discoverability and consumer engagement, Google may be introducing a new feature that will allow marketers new ways to connect consumers with brand content in the form of “streamable” apps. Last November, Google launched a pilot with nine brand apps that allowed them to stream to users without requiring them to install the app first. For example, if a traveler is using Google search to find a hotel room, they can click on Hotel Tonight’s link within the query’s natural results, and Hotel Tonight’s app UI will replace the user’s search result UI. The traveler can search for and book a room within that streamed app environment. It could increase usage of mid-use apps: If a consumer uses a marketer’s app infrequently and is out of device storage, they may delete that app and cease engagement. However, if the app is streamed and doesn’t live on the device, it could continue to be used from Google’s SERP instead. It could increase the importance of app indexing & paid mobile engagement ads: If app streaming catches on, SERP presence may become an absolute necessity for marketers, especially as Android has 79% of the global smartphone market. A lack of SERP presence could result in a lack of significant app engagement. Marketers will need to rely on Google even more as an app launcher: Google’s mobile search share is already at 94%. If Google continues to expand its usage and functionality, that percentage could increase even more. Like traditional apps, consumer usage rates will ultimately determine the success of Google’s experiment. However, the effort has its hurdles. Similar attempts to leverage HTML5 to get webpages to behave like apps – such as Mozilla’s mobile Firefox OS released in 2013 and recently abandoned due to lack of adoption – haven’t taken hold. Additionally, consumers have been using apps and app stores for almost eight years, and changing ingrained views on what an app is may prove difficult for the search engine. Marketers should keep an eye on how streaming apps develop and consider leveraging them as they gain acceptance. Authors: Scott Walldren, SEO Director and Kenneth Hamner, Associate Media Director at 360i.